Recently, I came back from a mostly relaxing cruise from the Baltimore, MD to Bermuda. After several days it’s been hard for me to get myself back into the swing of things as I’m constantly in perpetual nap mode and feel like I can sleep 24 hours a day. I thought I could get myself back up to speed naturally without the aid of caffeine, but no good. So on a Sunday afternoon I had to intervene and down 3 full cups of chilled coffee (I chill it so I can drink large quantities of caffeine fast). Furthermore, I tried to get my mind active again by turning on my computer and thinking about something rather intricate. So I thought about writing what I learned about the use of my cell phone on my trip to and from Bermuda and sharing my knowledge. So I will start off by stating this. Having an active cell phone during a cruise can become the most expensive thing you can do on any vacation in a foreign country, even if you never make a call. If your cell phone is capable of receiving email and connecting to the internet it’s possible for you to rack upu costs in in excess of a $1000 during the stay of the cruise without ever making or receiving a call! A simple solution to this is to simply leave your cell phone off completely as soon as you leave home. But if you’re like me you may want to leave some option of keeping in contact. Say there’s an emergency and someone needs to reach you. Or maybe the act of you being out of contact for several days straight could end up with you losing a client. If you simply leave you’re cell phone off and you’re on a cruise ship then your only option to keep in contact is using your ship’s phone which runs about $8 a minute! It’s safe to say that the communicating on a cruise ship is probably more expensive than anywhere else in the world, because you’re communicating on a satellite service and you’re completely at the mercy of what the cruise ship company wants to charge. There is a middle ground of options on ways to keep in contact with the rest of the world while you’re on a cruise without the risk of super high roaming charges, but there is no single best answer. I thought I’d outline some options I found on my recent vacation cruising on a Royal Carribean ship to Bermuda using an iPhone and trying to allow my dog boarding service to contact me if my dog gets sick, or allowing family members traveling in China to reach me, or allowing the body shop thats fixing my car to contact me to authorize repairs as needed. So here we go in terms of options to consider to avoid getting unexpected nightmarish phone charges. 1) Turn off cell phone and keep it off. This is the simplest option, but you can never keep in contact. As long as your phone remains off you will incur no charges. But do not think you can just turn on the cell phone periodically and avoid costs. For example, if there is back log off missed text messages or email while your phone was off, the moment you turn your phone back on you could get hit with a bunch of charges as your cell phone gets caught up on those missed texts and email. If you are not able to live strictly by keeping your phone completely off on your vacation then you want to read further. 2) Turn on Airplane mode and keep it that way. This is strictly for iPhone users. It allows you to continue to use your iPhone to listen to music or use Apps without worry of being charged. It’s almost the same as turning off your cell phone as you will not be able to send or receive calls, and you will not be able to use WiFi for internet. But do not think you can just turn off Airplane mode periodically and avoid costs. If you are not able to live strictly by keeping Airplane mode on your entire vacation out of the country then you want to read further. 3) Make sure data roaming is off. This is mostly for smart phone users. On the iPhone you can go into settings to keep data roaming off. This is normally the default setting. I did a recent test on light use of my iPhone and if I had data roaming on during my cruise I estimate I would have racked up over $900 in charges as my iPhone automatically got updates on my two email accounts and my Facebook account. Note that with data roaming off you will not be able to use the Google Maps or many GPS Apps on your iPhone as they depend on constant connection to the internet. 4) Use call forwarding. Did you know that if your cell phone is on, then if someone calls you and you don’t answer YOU CAN get charged a bundle for that missed call? If you don’t answer your cell phone it will go to your voice mail. If that caller chooses to leave a message you will get charged for every minute of that voice mail message at the roaming rate, plus possible additional long distance charges per minute. On my cruise that amounted to around $3 a minute. And after paying that amount you can’t even listen to your voice mail without paying that same $3 minute to listen to your voice mail. Ka-ching Ka-ching Ka-ching. Don’t bother contacting your phone company about disabling your voice mail. They can do this but then your caller will listen to a message from your phone company that your voice mail is disabled and you will pay for every minute of that message that tells your caller that you voice mail is disabled. The best solution is to enable call forwarding on you cell phone. Call forward to a local land-line telephone number. Then all calls to your cell phone are intercepted before they ever reach your cell phone and you can never get charged roaming fees for the missed calls. Furthermore, if that local land-line telephone number has a voice mail or answering machine then here’s a way for people to leave a message for you at no cost to you. Oh one more thing– on your voice mail or answering machine don’t let them know you’re away on vacation as it would tip off potential burglars that it’s safe to rob your home. Finally, do note that call forwarding is technically not completely free. Call forwards on your cell phone get treated as if you were at home using your cell phone to make a call to the number you are forwarding to. That’s why you only want to call forward to a local land-line number. If you subscribe to a monthly cell phone service plan then call forwarding time just counts against the allotted minutes in your plan. 5) CAREFULLY CONSIDER if you want your Text messaging service on or off. If you generally DO NOT get many text messages, then text messaging may actually be a very good and economical way of communicating with family. On AT&T roaming rates are 50 cents to send a non-picture text and 30 cents to receive a non-picture text anywhere in the world and on a cruise ship. BUT IF YOU HAVE FRIENDS AND FAMILY WHO LOVE to send you lots of text including picture texts (which generally run $1.30 per text), then you may want to TURN OFF texting service to your phone, because the moment you turn your phone on during your vacation your phone will connect and receive all missed texts, keeping you up to date on texts, and charging you for every text whether you want it or not. Your normal texting plan will not cover these roaming rate texts. If you really want to commit to lots of texting then subscribe to an international roaming texting plan. For AT&T if you pay $50 a month your covered for 500 texts. However, if you subscribe to such a plan note that you probably wont get the full 500 text allotment. Instead you’re account will be charged some prorated percentage of the full $50 and you’ll only get a prorated percentage of the 500 texts. This is just how the billing works. To disable texting you will need to call customer service and have them remove texting service from your account. So you will want to do this before you leave on your trip. Once you return then you can call back and have them turn texting back on. 6) Consider using email to keep in contact. If you’re willing to work a little harder to communicate, then look for ways to communicate by email. The key thing is to finding internet service. If you have a laptop, iPhone, iPad, or some other internet device you should look for free or low cost WiFi (wireless internet) service. If you don’t have anything then you can look for a local internet cafe and rent time on a computer, and use a web browser to access your email. However, it’s better if you can bring your own laptop, iPhone or iPad, because you can better control costs by connecting to WiFi long enough to download all your recent email messages, quickly disconnecting from WiFi and reading your email offline when you are not being charged. 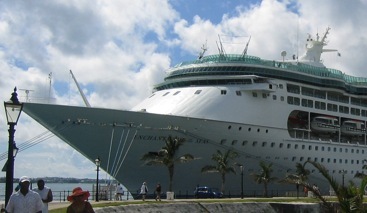 When I was on the Royal Carribean cruise ship they offered both WiFi service or rental time on a computer for about 65 cents a minute. This is not cheap but it’s much cheaper than $3 a minute for cell phone service or $8 a minute for the cabin phone use. 7) Consider paying for voicemail service. If you are planning to use option 4 and 6 above, then you also want to consider paying for a voice mail service. I did this myself as it gave me peace of mind. Once you’re willing to work a little more and spend a little more, this opens up more options on keeping in contact economically. If you make use of call forwarding to avoid getting charged for missed calls while your phone is on, you can make use of a paid voice mail service to take messages for you and send them to your email. You can usually get a voice mail service like this for around $7 a month. You pay them the $7 a month rate, and they give you a local phone to which you can call forward to take voice messages. If you already pay for a Skype online phone number then you can use your Skype’s voice mail service. You may ask why pay for voice mail service when your cell phone comes with voice mail. Because with your cell phone voice mail you will pay a bundle for roaming fees (read my description in option 4). A separate paid voice mail working with your cell phone call forwarding will NOT incur roaming charges and you get the added benefit of being able to listen to your messages where ever you can get email. Listening to voicemail by email is a lot less expensive than calling in to listen to your cell phone’s built-in voicemail. There are even voice mail services that will type out a transcript of the voice mail in the email. 8 ) Use Skype over WiFi to call people. If you can get ready access to free or low cost WiFi service, Skye is possibly the best way of communicating. With Skype you can have video phone calls with anyone else with Skype for free, or make or receive phone calls from any phone anywhere in the world for very low rates. You can make Skype calls from your laptop, iPhone, or iPad. However, DO NOT expect Skype to work well on a cruise ship. The cruise ship’s WiFi is generally not fast enough to support good quality voice calls, and please DO NOT EVEN think of turning on data roaming and using the cruise ships cell phone provided data service for Skype. I managed to get a few lucky minutes of somewhat choppy phone calls on Skype using the ship’s WiFi, but in the end I think the cruise ship blocked my Skype service over their WiFi as I was probably chewing up too much bandwidth. So eventually my Skype no longer worked. I’d say Skype is only good for WiFi service you find on land. So for me when our shipped was docked in the Bermuda it was possible to find a local WiFi service where one could use Skype. Unfortunately, I didn’t find this out until I was about to leave Bermuda. HERE’s a tip just for those cruising to the Royal Naval Dockyard in Bermuda (also known as Kings Wharf). In the Dockyard there’s a lesser known WiFi place called “Internationally Connected” near the Dock Yard Pastry Shop. As of the writing of this blog, “Internationally Connected” is located on the 2nd floor of a small building and they charged about $5 for 30 minutes of high speed WiFi. This is great for economical use of Skype as well as for options 6 and 7 above. 9) Buy a prepaid SIM card for your cell phone. If you can get this to work you get the ultimate in economical and convenient communication. I’d only consider trying this if you plan on spending a long time in a foreign country. There’s significant risk it may not work. Firstly, it won’t work with all phones. GSM phones use SIM chips. CDMA phone like those from Verizon and Sprint don’t. Also there are currently two different sizes of SIM cards: the regular SIM and the micro SIM card. Most prepaid SIM cards will be of the regular SIM size. If your phone only takes micro SIM cards you’ll need to invest in a micro SIM cutter so that you can trim down regular SIMs to fit in a micro SIM slot. Finally, your GSM phone may be locked to your cell phone carrier so you would need to invest in unlocking service. Are you getting a headache listening to my explanation? That’s why it may not be worth trying this. 10) Rent or buy a prepaid cell phone. This avoids all the complications involved with a SIM card described above, but now you have to contend with paying for the cell phone itself. 11) Just use your cell phone. This is by far the easiest but most expensive option. You can actually make and receive phone calls anywhere on a cruise ship and probably anywhere in the foreign country you are visiting. I have to admit all the above other options can be really inconvenient and take up a lot of valuable vacation time, so paying the extra for the convenience of using your cell phone as is, may be worth it. Also on a cruise ship this is the only way to call someone as attempting to use Skype on a cruise ship is likely to fail. Even I had to use this option to call family members traveling in China. IF YOU are going to ever consider this PLEASE do read option 4 describing the importance of enabling call forwarding on your cell phone. Some things to keep in mind if you are going to actually use your cell phone to make calls. Your phone company may offer special international roaming rate plans if you’re willing to pay an extra subscription fee. However, I’ve found that for many countries they offer little discount over standard roaming rate plans. For example with AT&T without a roaming rate plan calls in Bermuda were $2.29/minute but if you subscribed for $5.99/month you get a discount rate of $1.69/minute. Finally, the special international roaming rate plans don’t cover your cruise ship. The rates are strictly regulated by your specific cruise ship. On the Royal Carribean cruise ship with AT&T as my carrier the set rate was $2.99 a minute regardless of what plan you are on. I suspect that for all the cell phone carriers the rate is exactly the same $2.99 minute, but you should check yourself. So the above gives you an idea of options to consider before you travel. You’ll want to plan ahead your options before you travel. Hind sight is 20/20. I didn’t fully learn about the best way of using option 8 (Skype) until the final hour in Bermuda before I had to get back on the ship. But if I had to do this again I would have planned to use option 8 a lot more along with that WiFi service I found in the Royal Navy Dockyard in Bermuda. In the end I ended up using a combination of option 3, 4, 6, 7, and just a tiny bit of option 11. I mostly paid the cruise ships 65 cents a minute WiFi rate and in one instance I made very short cell phone calls from my cabin at the expensive roaming rate of $2.99 a minute. In the end I probably invested around $50 keeping in contact while away on a cruise ship for about 5 days. This is certainly expensive compared to communicating from home, but at least I was not exposed to the risk of a several hundred dollar bill, and it was always possible for someone to call my cell phone and leave a message and have me be able to listen to it and respond if necessary. I know thinking about the above might give you a headache. But to avoid getting a surprise thousand dollar bill from your phone company, it’s definitely worth looking thru the above options and planning. Anyway this is probably the most technical I’ve written in a blog, but at least it’s got my brain buzzed up and out of sleepy cruise ship vacation mode. If you have any questions about the above feel free to ask me by email at wilsoncheung@wakundama.com. Now that I’m much more learned and prepared I can dare say I’ll be able to respond to you within 24 hours anywhere in the world even in the middle of the ocean. Thanks for this post it was really informative and through. It tells you everything you need to know about cell phone rates and cruise travel. And the tips that you’ve suggest on how to keep in touch with people are also very good.